Police Commissioner Chris Dawson (left) and his senior officers in the upgraded Wembley station. Picture: Martin Kennealey. 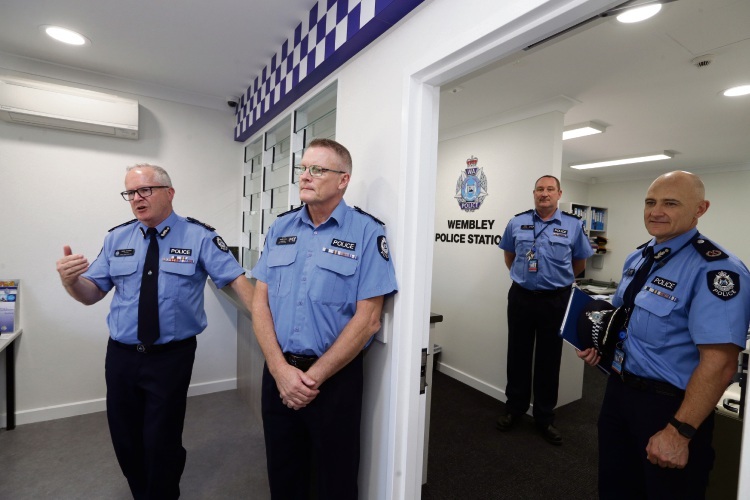 POLICE Commissioner Chris Dawson says the nearly completed upgrade of the 48-officer Wembley station will give its commander more control tackling local crime. “This is very much about putting back the officer-in-charge of that area,” Mr Dawson said while touring the station this week. He has made a point of reversing his predecessor Karl O’Callaghan’s Frontline 2020 policy that split police into roving patrols over wide areas and small teams of localised officers which followed up with investigations later. Mr Dawson said the changes at Wembley would not be a panacea, but enabled officers to use local knowledge and the commander to exercise his control over western suburbs’ crime issues such as beach car park thefts and other trouble spots. Changes at Wembley include the former sergeant’s house on Salvado Street becoming the new entrance, more secure cells, facilities to take DNA samples, a gym in the old entrance on Cambridge Street, better parking and fencing, and a lost property section. Mr Dawson said the changes were not a complete answer because of the restrictions that came with adapting buildings designed as a residential house and used as offices for policing. In Cottesloe, another post-WWII building is used as the area’s police station, with one officer and others passing through as part of Mr Dawson’s new Fremantle-police district. He said there were no immediate plans to improve Cottesloe but it was part of a longer-term plan for the metropolitan area. Fremantle’s station at a former High Street bank has been criticised as insecure and tenders are out for its replacement. Mr Dawson said because of the tender he was limited in commenting but would like to have a decision mid-year.